The College collects books authored by Fellows, former Fellows, and Old Members. These collections are based on donations from Fellows and Old Members, so new additions are very welcome. Both SOC and AL collections are partly catalogued, but a complete shelf-list is maintained, so any questions may be directed to the library staff. Books may be consulted in the Parker Library, or borrowed by members of the Fellowship. 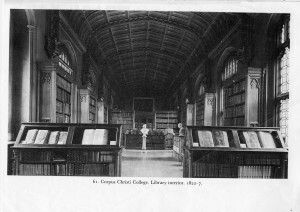 Additional works on the topics of Corpus and Cambridge history, students, architecture and daily life are collected in the Parker Library. These books are catalogued and may be requested through Parker Library staff. Henry Paine Stokes (1849-1931) was admitted to Corpus in 1872 and in 1912 he was made an Honorary Fellow of Corpus Christi College. Other posts he held were Hon. Canon at Ely, Vicar of Little Wilbraham and Vicar of St. Paul’s Church, Cambridge. Stokes was interested in Hebrew texts and Anglo-Jewish history, and was an active member of the Jewish Historical Society. The collection of H. P. Stokes was presented to Corpus in 1932, by his daughter Amy Stokes, on behalf of her mother. What is now the Stokes Collection contains books from this donation as well as some which were part of the Parker Library collection but were deemed thematically relevant and transferred to the Stokes shelves. Since then, some books have returned to their original classmarks, while others remain in the Stokes Collection. The books in the Stokes Collection cover a number of topics relevant to Jewish studies at the turn of the 20th century. This includes but is not limited to: Zionism ; the history of Jewish people in England, the United States, and certain European regions ; Hebrew and Biblical translation ; the ‘Jewish question’ ; and late 19th and early 20th century Jewish thought. The collection is catalogued under the STO classmark. Books may be requested and consulted in the Parker Library reading room. Edward Upward (1903-2009) matriculated at Corpus in 1922, where he read history and maintained his close relationship with Christopher Isherwood, a school friend, with whom he wrote the ‘Mortmere Stories’. Later, both Isherwood and W. H. Auden would cite him as a literary influence. Upward worked as a teacher from 1932 until 1961, with the majority of his work only reaching print in the ‘60s. However, in his ninth decade he experienced a resurgence of interest in and republication of his earlier works- when he died at the age of 105, half of his published work was from the last fifteen years of his life. The Upward collection was purchased at auction in 2006. It contains Upward’s own copies of his published books, as well as other books that he kept in his house on the Isle of Wight. Most of the collection has been catalogued and given the class-mark reference AL UP. Alternatively, a shelf-list is available here: Upward books. Books may be requested and consulted at the Parker Library. 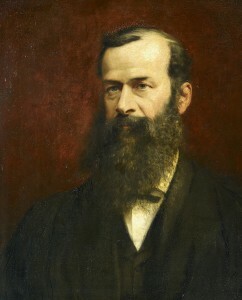 Samuel Savage Lewis (1836-1891) began his academic life at Corpus Christi College in 1865, and graduated BA in 1869, the same year in which he was elected Fellow. He was Librarian at Corpus from 1870-1891. Lewis collected antiquarian books in addition to classical artefacts (mostly coins, gems and seals), which he bequeathed to the College along with reference material associated with his antiquarian interests. The non-book objects are now on long-term loan to the Fitzwilliam Museum, while the books are under the remit of the Parker Library. The Lewis bequest contains books dating from 1468 through the 19th century, with a focus on classical languages, art and literature. Much of the Lewis Collection has been catalogued and may be requested and consulted in the Parker Library reading room. A shelf-list, arranged by subject, is also available by request. Corpus holds the complete collection of poems published by the Sceptre Press, 1959-84. They are primarily in booklet form, many of which were produced in very limited runs and are signed by the poet. The texts include work by Ted Hughes and Sylvia Plath in addition to lesser known 20th century poets. The collection was donated to the College by the late Martin Booth, owner of the Press and former Visiting Fellow. Booth both curated the works of other poets and published his own poetry through the Sceptre Press. Most of the booklets have been catalogued and may be requested for consultation in the Parker Library reading room. Any queries regarding the collection can be directed to parker Library staff. Canon C. R. T. C. Perowne, Member of the College, matriculated 1923. Following a successful career in diplomatic administration throughout the Middle East, he began writing in the 1950s on Jerusalem and Roman history. The Perowne bequest is primarily, but not exclusively, a collection of books relating to the history of the Knights Templar. Around 50 books of more antiquarian interest (the oldest is from 1551) are kept with the main Parker Library holdings and are searchable on the online catalogue. The Parker Library holds a collection of non-book items related to the library and the manuscript collection. This includes a wide variety of works including previous exhibition materials, offprints from journals, and conference material. A small portion of the pamphlets and offprints have been catalogued, but a rough list is available and any requests or queries are welcome.